Posted on October 24, 2013	by Richard M. Cash, Ed.D. Now that the school year is in full bloom, we’ve gotten to know our students. We are ready to dive deep into the curriculum, so let’s consider questioning techniques that can really improve our students’ abilities to think and thus learn. In John Hattie’s seminal work, Visible Learning: A Synthesis of Over 800 Meta-Analyses Relating to Achievement, he found that the use of deep levels of questioning had a significant effect on student achievement. This effect was due to students gaining better tools in how to think; increasing awareness of their own achievement; and understanding how to extend their own learning. What Hattie’s research shows us is that teachers need to be aware of—and effectively use and teach—quality questioning strategies. Dr. Diane Heacox and I devote an entire chapter in our book Differentiation for Gifted Learners: Going Beyond the Basics explaining the effective use of assessment to help students learn to self-monitor their own learning through quality questioning. Using the right kind of questions before, during, and after instruction can greatly increase student achievement, attentiveness, and motivation to learn. Below are four types of questions teachers can use, samples of those questions, and ideal times to ask them. Factual questions are asked to determine if the student has foundational knowledge of information. These are questions that seek verifiable answers. Information to answer these questions can be found on the page and are usually repeated back verbatim from the text or source. These questions require the least amount of “brain energy” to answer. Who was in love with Hamlet? What are the common elements of alkali metals? Which country had the highest GDP in 2012? What is 320 x 46? Teaching students to ask factual-level questions, both of themselves and others, can ensure that the foundations of information have been gained. Factual questioning is at the recall level of memory. Convergent questions take factual levels of questions to the next stage. While the information needed to answer convergent questions is also verifiable, the answers require a greater level of comprehension, inference based on personal interpretation, as well as analysis of the materials. These questions can be open- or closed-ended. Convergent questions take more brain energy to answer, because there may be multiple responses or a listing required to answer the question. What were the reasons Ophelia went mad? In what ways do alkali metals differ from other metals? Why do some countries continue to have high GDPs from year to year? What are some other ways to solve the equation 320 x 46? Convergent questioning seeks for students to “converge” (connect) information beyond the text or presented information. This level of questioning uses the thinking strategies of comprehension, application, and analysis. Convergent questions often seek lists or multiple factors in the answer. To diverge means to extend in different directions from a common starting point. Divergent questions are those that will have various “right” answers, but must be supported with data both within and surrounding the text or information. Students must make knowledgeable and logical projections, intuitions, or creations. Synthesis is the main thinking level of divergent questions and requires a significant amount of brain energy. These questions will always be open-ended. What might have become of Hamlet and Ophelia’s relationship had Hamlet not been so obsessed with revenge? How might alkali metals be used more effectively to improve the human situation? How might newly industrialized countries increase and sustain their GDP? Create a unique way to explain the solving of triple-digit multiplication equations, such as through the use of a metaphor or simile. Most students have been trained to answer closed-ended questions. Many struggle when faced with questions that don’t have one right answer or require “out-of-the-box” thinking. Success in the 21st century includes the ability to think openly about complex situations. Therefore, a critical component of learning for the 21st century is through divergent types of questioning. Students should learn how to construct, ask, and answer these types of questions. Divergent questions require sophisticated levels of analysis, evaluation, and synthesis. 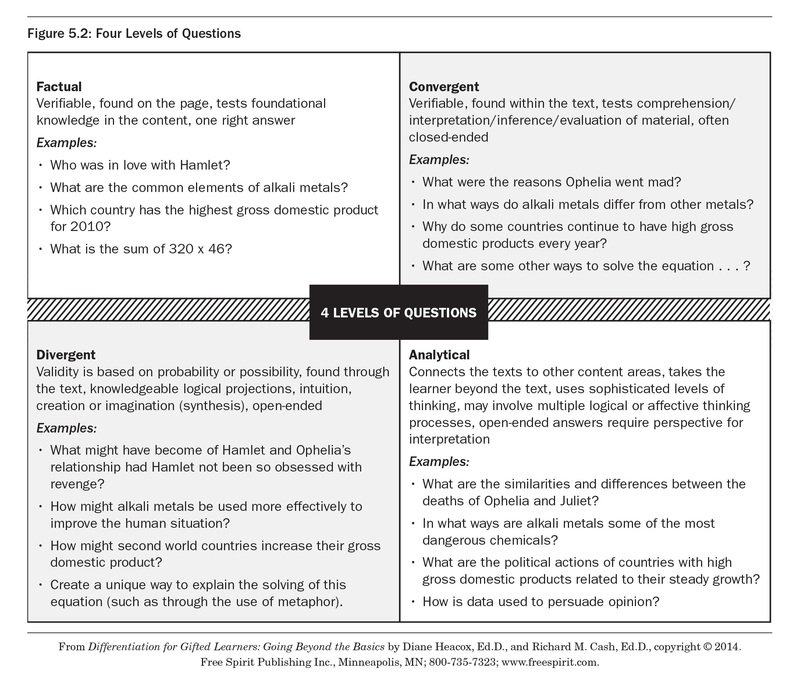 Analytical questions connect the text or information between and to other content areas. The questions take the learner beyond the text by using sophisticated levels of thinking. Answering these questions may involve multiple logical or affective thinking processes. Questions are formed as open-ended, seeking answers of perspective that can be debated. Similar to divergent questions, analytical questions require the most brain energy to answer and interpret. What common principle(s) links the deaths of Ophelia and Juliet? In what ways are alkali metals some of the most dangerous chemicals? What are the political realities of countries with high GDPs in relation to their sustained growth? How is data used to persuade opinion (or intentionally misinform people)? The act of analysis is to look closely at information, identify both common and uncommon elements, and prepare for discussion and debate. Preparing students through teaching them how to construct and answer analytical questions can better prepare them for the complex problems they will face in life. Analysis is also an essential tool in decision-making. When students are aware of and use more sophisticated levels of questioning, they are more likely to authentically engage in the content. Authentic engagement will assuredly lead toward authentic learning and higher levels of achievement. Turning questioning over to the students also ensures a student-centered classroom. What are some examples of effective questioning strategies you have used in the classroom? This entry was posted in Professional Development, Teaching Strategies and tagged 21st century skills, differentiated instruction, differentiation, Free Spirit author, questioning strategies, teacher resources. Bookmark the permalink.